jQuery touchSwipe Carousel/Slider plugin is required for detecting swipe events on on touch input devices and falling back to mouse ‘drags’ on the desktop. Slider Pro is a modular, responsive and touch-enabled jQuery slider plugin that enables you to create elegant and professionally looking sliders. ItemSlide.js is a jQuery plugin for a touch enabled carousel that works both on desktop and mobile. Editable Listview is a jQuery Mobile Listview Widget that features an intuitive UI to allow insertion of new list items and removal of existing ones. OWL Carousel 2 is a fully responsive and touch friendly carousel for jQuery/Zepto. It comes with number of features such as infinity loop, handle 1000’s items on mobile devices, smart speed, callback events, item margin, anchors navigations and many more. BrowserSwipe.js is a simple tool to allow for trackpad swipeevents when you have disabled scrolling on your site. TouchSwipe is a jQuery plugin to be used with jQuery on touch input devices such as iPad, iPhone etc. Glide is responsive and touch-friendly jQuery slider. 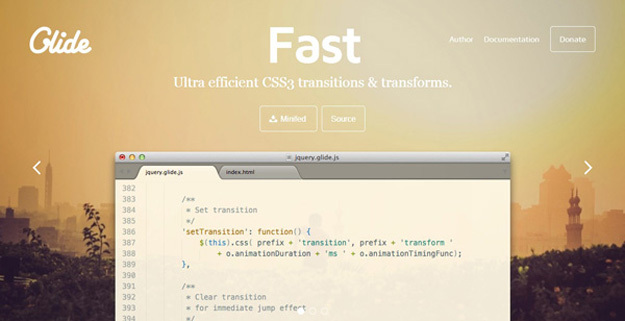 Based on CSS3 transitions with fallback to older broswers. It’s simple, lightweight and fast. 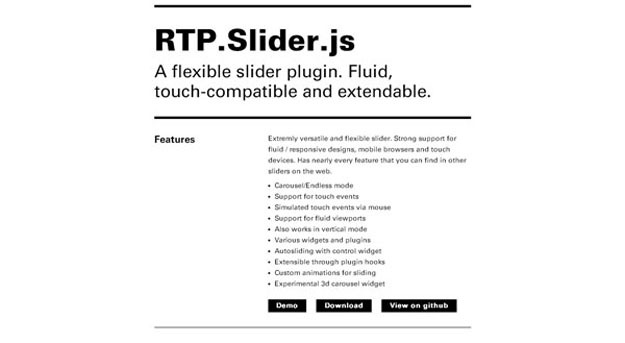 Its an extremly versatile and flexible slider. Strong support for fluid / responsive designs, mobile browsers and touch devices. Has nearly every feature that you can find in other sliders on the web. Touch Image Gallery is a simple image gallery that caters to mobile and desktop browsers alike, by being touch/swipe friendly, in addition to the traditional way of navigating. Swiper – is the free and most modern mobile touch slider with hardware accelerated transitions and amazing native behavior. It is intended to be used in mobile websites, mobile web apps, and mobile native/hybrid apps. Designed mostly for iOS, but also works great on latest Android, Windows Phone 8 and modern Desktop browsers. Swiper is not compatible with all platforms, it is a modern touch slider which is focused only on modern apps/platforms to bring the best experience and simplicity. 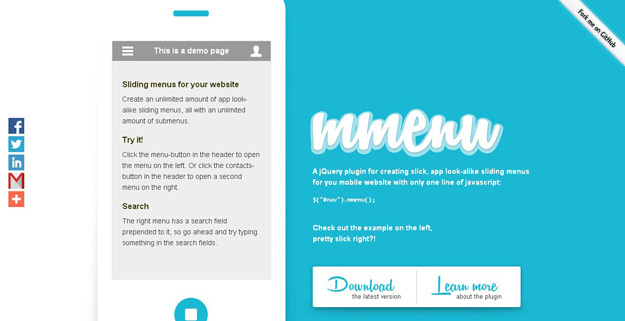 mmenu is a jQuery plugin for creating slick, app look-alike sliding menus for you mobile website or responsive website. Flip is jQuery/jQuery mobile plugin to give Flipboard app like effect. Flip effect uses css 3d transform. Flip effect currently works on WebKit browsers (e.g. Chrome, Safari, including iOS mobile safari) or Firefox 11. It still works with other browsers but the “slide” effect will be selected forecely. Dragend JS is a swipe plugin for jQuery. It’s open source and uses hammer.js for observing multi-touch gestures. jQuery Navobile is a jQuery plugin that makes mobile navigation easy. Navobile uses CSS to apply CSS3 translations, Mobile device detection and fixing the position of nav. SlideToucher is a touch enabled jQuery plugin for content swiping. Supports vertical and horizontal swipes.